Time to panic about Phillies pitching? Maybe. I know, I know. It's April 14. 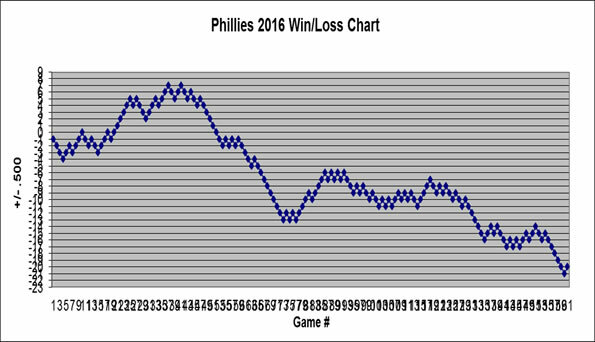 The Phillies haven't finished their fifth series; they still have 149 games left; they haven't even seen the Mets yet. Heck, we are still 43 days away from Memorial Day. But Aaron Nola hasn't pitched a great game yet. Pivetta has failed to give his team a mediocre outing after three starts. And now Zach Eflin, who dazzled in his first two starts, got destroyed by the Marlins. There were major concerns about the starting pitching entering the season and the Phillies have done nothing to calm any fears. Let's start at the top with Aaron Nola. No reason to worry about him, right? He's as solid and reliable as they get and one of the coolest cats you'll find. He'll bounce back and have yet another Cy Young worthy season, just like he had the last...wait, he's only really had one great season. That's not to downplay anything Nola has accomplished or to suggest he's not the ace we think he is. But this isn't Roy Halladay coming off his Cy Young season with the Phillies. He had already won 169 games and at that point. Max Scherzer had 159 wins and 3 Cy Young awards to his credit when he nearly won his 4th last year. Jacob deGrom, who won the award last year, has started 46 more games in his career than Nola, has 15 more victories, and his 2.68 career ERA is nearly a run less than Nola's 3.43 career mark. Again, I mention this simply to suggest that Nola is not worry-proof. He lacks a track record where one can safely say, "Nah, don't worry about Nola, he'll do what he always does." There is absolutely no reason to think Aaron Nola won't have a good year. But we can worry that he won't have a great season. What if Nola matches his career totals with a 3.43 ERA this season? Hard to complain about that, but the difference between a 3.43 ERA and the 2.37 ERA he posted last year is monumental. The whole foundation of the Phillies starting rotation, and in some ways the entire roster, is predicated on Nola being a true staff ace. If Nola repeats his 2018 season, Arrieta can do his thing, and the Phillies should be able to survive with mediocre results of their 3-4-5 starters. But if Nola is just OK this year, the Phils need marked improvement from the grouping of Pivetta, Velasquez, and Eflin. That brings us to the aforementioned trio. Nick Pivetta has been downright atrocious through his first 3 starts: 9.45 ERA, 2.175 WHIP, average of 4.4 innings per start. He's become a two-pitch pitcher, as Bob Wankel pointed out, and he really doesn't seem to have an idea of where any of his pitches will land. Pivetta is a two-pitch pitcher that can't consistently locate those pitches. If there's been growth, it's hard to see it. I'd probably let him take two more spins through the rotation, but if he can't put together a crisp start, it's going to be time to look elsewhere. There were talks of Pivetta having a breakout year, both locally and nationally, but he seems like the same old Nick Pivetta to me. Then there is Vince Velasquez, who very few have legitimate beliefs that he will maintain his spot in the rotation after this season. Vinny had nice results in his first outing (6 IP, 4 hits, no walks, 2 ER), but he did not look particularly impressive. Meghan Montemurro showcased a 5-pitch sequence that "highlighted how this version of Velasquez can be the quality backend of the rotation starter the Phillies need." Pitch #1: Hanging curve ball. Pitch #2: Slider nowhere near the strike zone that fortunately created a swing and a miss. Pitch #3: 0-2 curveball that literally hit the plate. Pitch #4: Four seam fastball that ran right into the middle of the plate. Pitch #5: Quality fastball on the outer half to induce a weak fly ball. Of those 5 pitches, only one was a quality pitch...and that was supposed to be a positive sequence. In my opinion, it's just not there for Velasquez and he will be out of the rotation by the All-Star break. Finally, we have Zach Eflin, who showcased himself nicely in his first two starts, allowing a single run in 12 innings. We have seen that version of Zach Eflin before. Eflin had 7 starts last season in which he allowed one run or less, averaging 6.2 innings in those starts. Last night, however, Zach allowed 6 runs in four innings. We've also seen that Zach Eflin before. He had 7 starts last season in which he allowed 4 or more runs and averaged 4.2 innings per start, and four outings in which he allowed 5 or more runs and averaged 3.6 innings per start. We obviously need a larger sample size in order to make any proclamations, but early indications are that the Phillies' 3-4-5 starters are exactly who they were last season. April 14 might be too early to panic, but it's not too early for Gabe Kapler and Matt Klentak to start peaking in on Lehigh Valley, where Jerad Eickhoff is 2-0 with a 4.50 ERA in two starts.